A dispute over an HTC smartphone ad took a surprisingly theoretical turn recently, with a British ad watchdog forced to decide whether consumers could dive while taking selfies as skillfully as Olympic medalist Tom Daley. 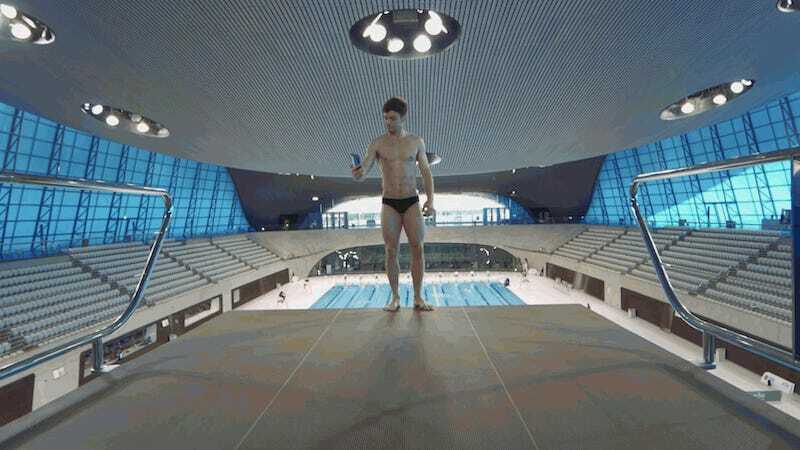 Though the ad itself doesn’t show Daley hitting the water, HTC said in response that “Daley landed on his feet in the ad and that by landing feet first he was able to stop his penetration into the water,” according the ASA. Additionally, HTC said the diver held the phone over his head so that it didn’t submerge more than one meter deep, conforming with the phone’s water resistance rating. HTC also included a disclaimer in the ad—“Don’t try this stunt, Tom’s a professional. HTC U11 has an IP67 rating.”—but the ASA found that the warning was insufficient as it could reasonably be applied to Daley’s diving, and not the depicted use of the phone. Ultimately, the ASA ruled that the ad was misleading and banned it in its current form, as the average person is likely unable to perform such a stunt successfully. “While we acknowledged that a professional Olympic athlete such as Tom Daley would be able to dive from a 10-metre high diving board and keep within the 1 metre distance required, we considered it unlikely that a consumer attempting something similar would be able to avoid being submerged to a depth which did not exceed, even briefly, that measurement,” wrote the ASA. iPhone Ad Pulled in UK Because It&apos;s "Not Quite True"